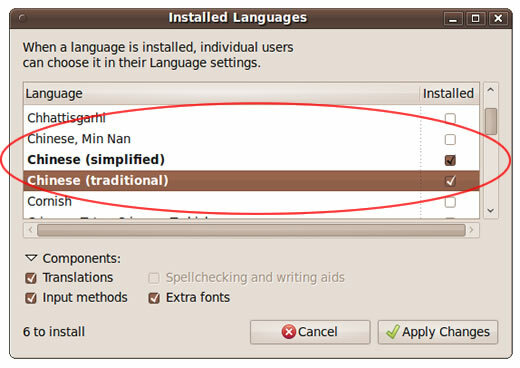 The free Ubuntu operating system includes easily installed Chinese fonts and input methods (Pinyin, Zhuyin and others) plus OpenOffice.org with Asian language features. 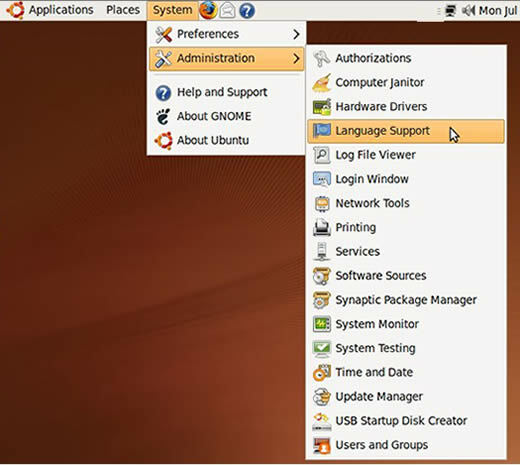 The growing popularity of Ubuntu — and the release of the Ubuntu Netbook Remix — convinced me to begin offering an Ubuntu Chinese setup guide here. You do NOT need to do anything on the command line to install these features anymore. Just run the installer, click around in a few menus and dialog boxes, and you're done! I'm no Linux expert, but this was easy. 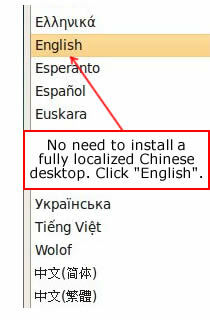 I'm going to assume that you're wanting to use Chinese in an English language Ubuntu system. 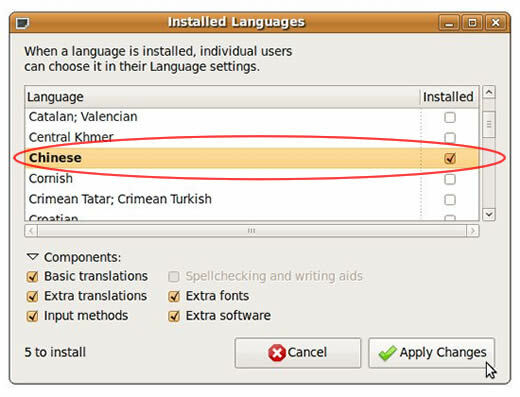 During installation, just click "English" when presented with localization choices in Step 1. It is possible to install Ubuntu as a localized Chinese system with most of the GNOME menus and dialogs in simplified or traditional Chinese, but this is not necessary. You can get Chinese features working in the English version just fine. I'm not going to provide full instructions on installing Ubuntu as this is now a fairly simple process and is well-supported on the main Ubuntu website and other forums. My next step picks up after installation and updating are complete. Make sure you are connected to the internet whenever you update Ubuntu. It will need to download many files for Chinese support. 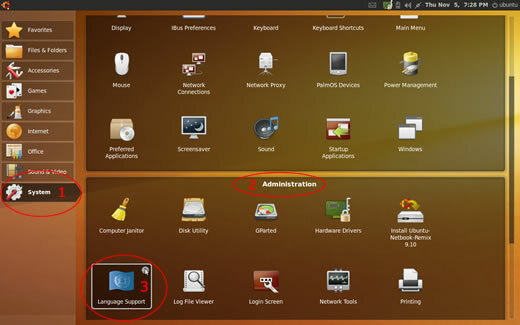 in the 9.10 Netbook Desktop, click "System" (1) and then in the lower half of the screen you'll see "Administration" (2). There you'll find a "Language Support" icon to click on (3). 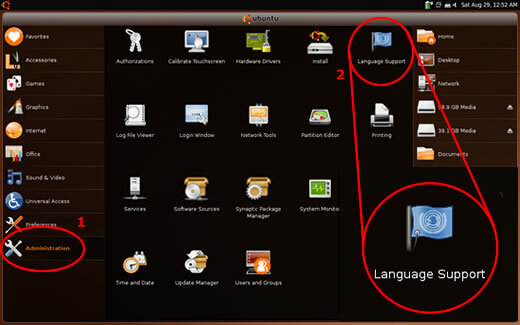 in the 9.04 Netbook Desktop you'll find "Administration" at the lower left of your desktop (1), and after clicking there you'll find a "Language Support" icon to click on (2). 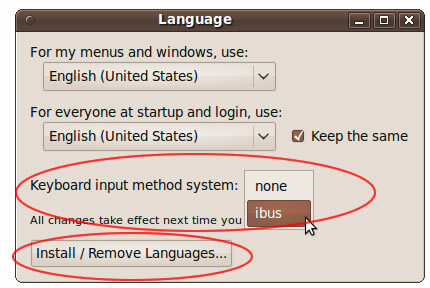 In Ubuntu 9.10, pull down the "Keyboard input method system" and select "IBus". 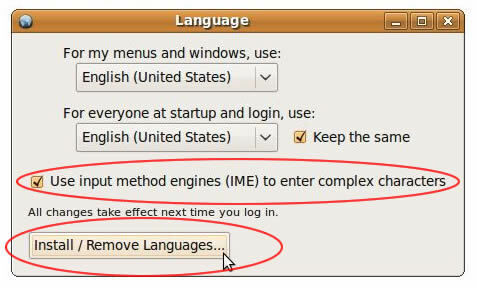 In Ubuntu 9.04, click to check/tick the little box next to "Use input method engines (IME) to enter complex characters". Then click the button that says "Install / Remove Languages...". "Installed Languages" will appear. Scroll down to "Chinese", which is a simple choice in 9.04 but in 9.10 you now have this split into "Chinese (simplified)" and "Chinese (traditional"). There's even a "Chinese Min Nan" option now! I haven't tried that one, since I only know enough Taiwanese to get my face slapped ;-) but this is yet another first for Ubuntu. Click the checkbox or checkboxes in the "Installed" column as shown below. Usually you will want to leave all of the "Components" boxes checked as well. Click the "Apply Changes" button. Enter your administrator password if required, and the system will download and install a big package of Chinese fonts and other resources for both Ubuntu and OpenOffice. When you get a dialog box telling you "Changes applied", click the "Close" button and then in Language click the "x" in the upper right hand corner to close that too. Then (as you may have learned from a little note in the Language control panel) you must log out to let the changes take effect.